Wellington Radio opened on 26 July 1911 as New Zealand’s first wireless telegraph station. It closed after 82 years on 30 September 1993. In 1909 an Australasian Telegraph Conference was held in Melbourne and this led to a New Zealand Government decision to establish marine radio coast stations in the capital, Wellington, and at Auckland and the Chatham Islands. 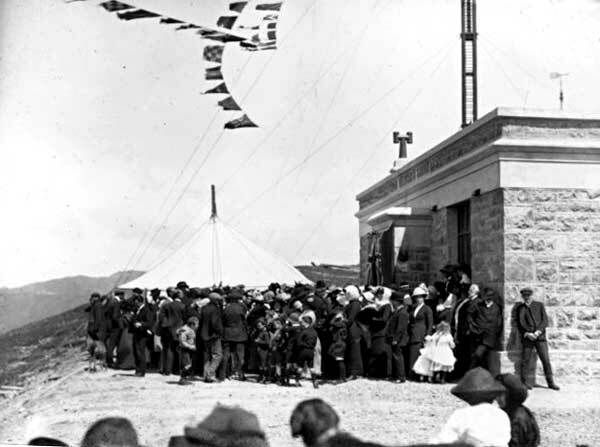 The first station, which used a 2.5 kW Telefunken ‘spark’ transmitter, opened on 26 July 1911 and operated from the clock tower of the General Post Office in Wellington. Only three months later, in October 2011, the station was transferred to 301 metre high Mount Etako (also known as Mt Wakefield or Tinakori Hill and since 2009 officially known as Te Ahumairangi Hill) where it provided a wireless telegraph service to ships within a 600 mile radius. In addition, two high-power (15 kW) stations with a range of 1250 miles were opened in 1913, one in the Far North near Kaitaia at Awanui (VLA, later changed to ZLA) and the other in the South between Invercargill and Bluff at Awarua (VLB, later ZLB). All of these coast radio stations have now closed. Listen to final transmissions from Wellington Radio ZLW and watch an interview with former operator Peter Baird. One visit in particular was Bahia Blanca in Argentina (with Lamport and Holt Line) where I actually went on air and was receiving and sending telegrams – a very lax station ! Great to hear this programme. Brings back fond memories of my short seagoing career in the Atlantic region listening to coast stations such as Portishead in UK, Norddeich in Germany and the US stations. Such a valuable service was provided by dedicated professionals in what was at times very difficult when there were distress situations. But it was good to hear the camaraderie among the interviewees, and it did provide me a smile with the Morse being keyed during the section on receive errors! I worked at ZLW as a technician between 1958 and 1964. Loved the job there but by then it was on the wane with major services being taken over by Himatangi Radio and then the Compac cable with ZLW as standby. “Ed” Beckett was Supervising Tech with Bert Wiggins as his deputy. Down at the receiving station ? Carter was Station Supt followed by Dave Shearer. Across from the receiving office was the staff hostel which was still in full swing. I left the service in 1964 to pursue a career in Broadcasting with the NZBC but part of me stayed with Wellington Radio. I did my training at the P & T Radio Telegraph School in Trentham in 1962. From there I went to ZLW and the ITO in the CPO, Featherston Street, Wellington. Left P & T in 1964 to join the Navy as a telegraphist. Peter Baird mentioned above, was one of my classmates at Trentham. Hi Jim: Have you seen our new section on NZPO radio technician training? Here’s the page for Trentham and I hope you let me know if you have any info to add (or correct) or photos. I lived there at the accommodation block for a while. Can’t remember exactly the date but it would have been sometime between 1966 and 1968. I worked in the ITO at the CPO in Featherston St as a radio operator. We had radio circuits to the pacific islands and Scott Base in Antarctica, plus normal teleprinter circuits to the rest of the world. I had a good time up there at Wellington Radio, remember it well. The Radio Training School was run by the Post Office and was situated in Taita. Many of us trainees lived in the PO Hostel at Trentham army camp and caught the train to the Radio School every day. Brian Webb and Brian Poole were the instructors when i attended. Thanks Geoff: Have you seen our new section on NZPO radio technician training? Here’s the page for Trentham and I hope you let me know if you have any info to add (or correct) or photos.